Our Tomato Contest was a Hit! 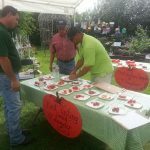 We had a great time at the tomato contest, and hope you did too! For those who want to know, the winner of the “Best Tasting Large Tomato” was a Celebrity, and the winner of the “Best Tasting Small Tomato” was a Black Cherry.